Order within 49 hours and 19 minutes to receive your order by Tuesday 23rd April. There is something magical about the partnership of diamonds with a coloured stone. A vivid red ruby has such a royal colour that even the diamonds are able to reflect the colour. This ruby and diamond cluster ring has been gorgeously crafted out of 18 carat white gold which has formed a stunningly solid plain shank. The plain shank simply moves around to the central setting with a slight elevation as it approaches. The graduation of the ring shoulders has created lower pierce decoration either side of the setting. Behind the stones there is a boat styled setting adding character to the ring. The oval cut ruby is the centre piece of the ring and has such a stunningly deep colour has it vibrantly bursts amongst the surrounding diamonds. 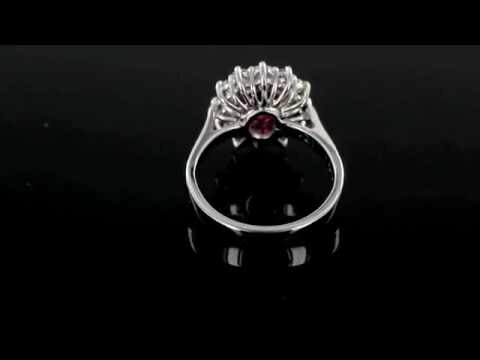 The diamonds then halo around the ruby each having been set within a mini four claw setting with create a flawless movement of the ring from stone to stone. If you should have any further question regarding this ruby and diamond cluster ring then please do not hesitate to contact us.